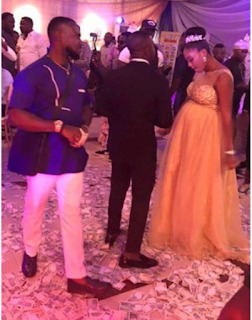 The high society wedding of a Nigerian big boy has sadly crashed following conflict of interests between the couple only 10-months after their marriage. Nigerian big boy, Donkwe Darlington who had one of the biggest wedding events of the year in 2016 where wealthy men were in attendance and made money rain, has announced an end to his 10-months-old marrage. Donkwe made the announcement on Facebook, citing incompatibility as the reason for their separation. He, however, subtly threatened to say more on the matter if pushed to the wall, adding that he and his wife who he had a child with, tried everything to fix their marriage but it just didn't work. Below is what he wrote: "I have decided to address these and I promise you that this is not a joke and not an attempt to be snarky. We realize that this probably comes as a shock to a lot of you and we apologize about that. We did not come to this decision lightly. We tried to "fix" our marriage in various ways, on our own and with the help of various professionals. Ultimately, what we are left with is a situation that makes neither of us happy. "We are amicable. We are working together to get through this. We are both hurting? but we do not hate each other. We have decided to part at this time in order to maintain congeniality so that we can continue to face our future. We genuinely wish the best for each other going forward. We also ask that if you are going to message us, please do so via private messages instead of a wall post. For those of you who have walked through this with us, you have our thanks and our love. 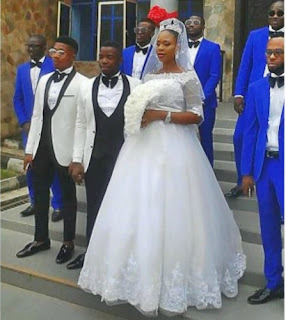 "I know that some people might say it's tacky to announce something so personal on social media but this announcement is going to inspire people to be real and honest to themselves, the plan was to build an empire together not to manage and i place no blame on any of us keep note to this, (judgmental people of Nigeria , we are not just compatible to each other and their is nothing to explain). further statement might come up if pushed to the wall. having said these, i hereby announce to you that our marriage has failed. #DONKWE"